Kamieniee Kamenetz, or Kanienetz-Podolskoi, a town of Russia, capital of the government of Podolia, 12 m. N. of the Dniester, on the left bank of its confluent the Smotritza, 235 m. N. W. of Odessa; pop. in 1867, 22,400, of whom half are Jews. It is the seat of a Greek eparchy and a Roman Catholic see. The principal buildings are the cathedral of Peter and Paul and four other Greek churches, several convents, one Armenian and three Roman Catholic churches, a Greek theological seminary, a gymnasium, two public schools, and a government library. The town has some manufactures and a considerable trade, especially in peltries with Moldavia. 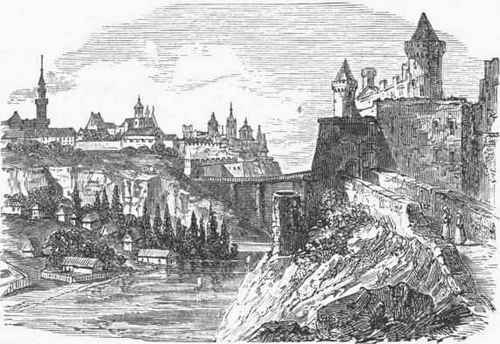 Its fortifications were razed in 1812; it has still a citadel and a detached fort. This place was the strongest bulwark of the Poles toward their Turkish frontier. The Turks took it in 1672, and held it till the peace of Carlovitz in 1699. Kamouraska, an E. county of Quebec, Canada, bounded S. E. by the state of Maine and N. W. by the river St. Lawrence; area, 1,017 sq. m.; pop. in 1871, 21,254, of whom 21,038 were of French descent. It is drained by Du Loup, Kamouraska, and Ouele rivers, and other small tributaries of the St. Lawrence, and by some affluents of the St. John. The surface is diversified, and in the south mountainous. Wheat, rye, barley, oats, and potatoes are the principal productions. It is traversed by the Riviere du Loup division of the Grand Trunk railway. Capital, Kamarouska. Kampen, a town of the Netherlands, in the province of Overyssel, on the Yssel, 8 m. W. N. W. of Zwolle; pop. in 1869, 15,653. It has a gymnasium and an industrial school, machine shops, iron founderies, and manufactories of stockings and cigars. It is traversed by a canal, and its river trade is rapidly increasing. There is regular connection by steamship with Amsterdam, Zutphen, Nimeguen, Arnhem, Emmerich, and Cologne. Kanabec, an E. county of Minnesota, drained by Snake river, a branch of the St, Croix; area, 540 sq. m.; pop. in 1870, 93. The surface is uneven and partly covered with forests. Capital, Brunswick. Kanawha, a S. W. county of West Virginia, intersected by the Great Kanawha and drained by Elk, Coal, and Pocatalico rivers; area, about 1,100 sq. m.; pop. in 1870, 22,349, of whom 2,184 were colored. The surface is mountainous, and the uplands are mostly covered with timber. The valleys are fertile. It is traversed by the Chesapeake and Ohio railroad. The chief productions in 1870 were 46,000 bushels of wheat, 406,826 of Indian corn, 96,268 of oats, 44,300 of Irish and 7,905 of sweet potatoes, 412,469 lbs. of tobacco, 20,457 of wool, 163,142 of butter, and 2,840 tons of hay. There were 2,426 horses, 3,400 milch cows, 1,078 working oxen, 4,011 other cattle, 9,879 sheep, and 15,714 swine; 4 manufactories of saddlery and harness, 9 of salt, 1 of woollen goods, 1 of iron castings, 39 of cooperage, 3 of flour mills, and 11 saw mills. Capital, Charleston, which is also the capital of the state.